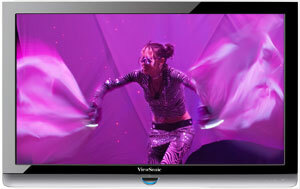 At CES in January, ViewSonic announced their new ViewLED line of HDTVs that feature edge-lit LED technology. The VT2300LED, a 23" 1080p display, is the first one of the models to hit the streets. Nowadays when I see a 23" screen, I think computer monitor first and HDTV second. 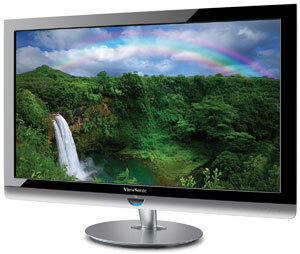 But with superior picture quality from the LED back-lit screen, this ViewSonic reverses that pecking order. Of course, if you are in the market for a TV for your home office or dorm room, then the VT2300LED offers the credentials for both a good looking HDTV and a great sized computer monitor. I'm tempted to give the VT2300LED an extra half star for its LED edge-lit display, but the no-more-than-average audio performance reaffirms my 4.0 conviction. With three HDMI inputs and one Component in, you have enough connections to attach Blu-ray players, game consoles and more. The unit doesn't include any USB or LAN ports. If you want to connect this TV to the Internet or your home network, then attach it directly to your computer. Setup is fairly easy to navigate with only a few basic controls like Brightness to tweak, which is lucky because the manual gives you no detailed information or guidance. At $399 retail, the VT2300LED is a little steep even for an LED back-lit TV. But a quick online search revealed that you can find this 23" 1080p model for at least $100 less. For that price, this ViewSonic is a compelling candidate for a second TV in the bedroom or a TV/monitor for your home office. Sitting below the black high-gloss 1" bezel that surrounds the non-reflective screen is a matte gray curved accent that is highlighted by a big semicircular Power button that is illuminated by a crescent blue light when the TV is on. Also on this gray edge on the right are six slightly embossed symbols, which are the operational buttons. Unless you are adept at reading Braille, I suggest that you use the remote control, especially if you need to work through the menu settings. The 12.3 pound VT2300LED does not swivel side to side on its stand, though it is light enough that you can turn it stand and all or simply pick it up and move it. The screen does tilt backwards and forwards about 10 degrees which is a handy adjustment since you cannot raise or lower the screen on the stand. You can also detach the stand and wall mount the TV. The VT2300LED provides two connection panels. The smaller one is located on the left edge and contains one HDMI input, one Component video (YPbPr) in (with matching stereo Audio in), a digital SPDIF audio output, a Headphone stereo mini-jack output and a Service port. On the back of the TV, facing out is a larger panel with two more HDMI ins, one S-Video in, one Composite video in (with matching stereo Audio ins), a VGA input (15-pin mini D-sub) with its own stereo audio mini-jack in, and a TV Input jack where you connect an antenna. If you are serious about audio performance then you can route audio out of the TV through the digital SPDIF output into a sound system that has more muscle than the insubstantial integrated pair of 5W speakers. The RF antenna connector (TV Input jack) links to integrated ATSC/QAM tuners. Since the tuner system is Clear QAM compatible, you can attach your cable TV signal directly into the RF connector and tune in unscrambled cable stations. Just don't expect that it will be able to receive every cable channel without a set top box. With the proper antenna, you will be able to tune in digital signals broadcast over the air with the ATSC tuner. The VT2300LED does not provide a LAN connection to connect to the Internet, which means no widgets like many of the new larger TVs supply. But if you double duty this TV as your computer monitor, you already have direct access to the Internet and your home network. Even though my office seems to be a breeding ground for remotes, I love having them, even for a 23" TV. This ViewSonic remote, with its matte black finish and gray non-backlit buttons, is nothing to write home about. But it gets the job done. On the other hand, I found the 25 page manual a bit too sparse, especially when it came to describing the Picture options. The writer took more ink detailing how to set the time on the TV. On May 1, the EPA began publishing a list of TVs that qualify under the new tougher Version 4.1 ENERGY STAR Program Requirements. (You can find it here.) 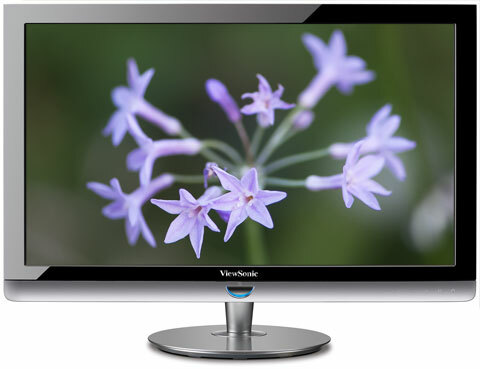 The ViewSonic VT2300LED is not on the list, though that doesn't necessarily mean that it doesn't meet the new standards. Anyway, we took our own set of power consumption readings by hooking the VT2300LED up to our watt meter, called Watts up? Pro. During regular computer monitor functions, the meter topped out at 26W. As you will see later, I lowered the Backlight control to 35 out of a possible 100. If I pushed it up to 50, the meter reading rises to just below 28W. The manual states that typical power consumption is 30W. For comparison last year's ViewSonic VT2342 measured around 41W and on the new Energy Star 4.1 list, I'm seeing other manufacturers' 22 and 23" models that are in the 35 to 40W range. The LED backlight is usually more power efficient than traditional CCFL backlights and the VT2300LED reiterates that fact. When I turn off the TV, the reading drops like a rock to 0, which also is good. We use the test patterns to adjust black level, white level, and color bias. The player is set to output a 1080p signal, which is the native resolution of the VT2300LED. The TV is also compatible with both 24Hz and 60Hz signals. Before you start the calibration task, I suggest that you sample the VT2300's four Picture Modes: Dynamic, Standard, Soft and Personal. You might find a default that appeals to you and you won't need to dirty your hands with this setup process. I encountered Soft for the first time when I reviewed the ViewSonic VT2430. If has the look of what would usually be termed Movie or Cinema. I liked it but decided that I should persevere through the process. I picked Personal and moved on. With LCDs, one of the first settings that I look at is the Backlight. ViewSonic doesn't put that control in the usual place, the Picture Menu. Instead, Backlight can be found in the Setup Menu alongside items like Menu language and Closed Caption. I turned Backlight to 35 (on a scale of 0 to 100). If your TV is in a brightly lit room, you may want to push Backlight a little higher. Up next was Color Temperature, which ViewSonic labels Color Mode and furnishes four options, Cool, Normal, Warm and Personal. No matter which you pick, you can fine tune them with sliders for Red, Green and Blue. I chose Personal. As I was searching for Advanced controls, I ran across DCR just above Backlight in the Setup menu. The manual gives no indication on what DCR is, not even what the acronym stands for. So I Googled it and discovered that for ViewSonic, DCR stands for Dynamic Contrast Ratio. Turn DCR on and the TV automatically adjusts the picture to realize "the potential static contrast ratio of the LCD panel in dark scenes." If that sounds good to you, then turn on and drop out because when DCR is enabled, all of the basic Picture controls, like Brightness and Color, are disabled. I decided to leave DCR off. With that done, I could return to the Picture menu and work through the test patterns. On my configuration of equipment, Brightness at the default of 50 was way too bright. I lowered it to 29. I left Contrast at 50. The test patterns indicated that Color (Saturation) should be lowered to 40 from the default of 50. When I looked at video of people, they looked too pale and I raised Color to around 45. I fiddled with Tint (Hue), but ultimately left it at 50. The range for Sharpness is 0 to 100. Anything above 30 causes unsightly fringing. I set it to 25. Basically, at the Default settings for the Personal picture mode, the image was too, too for my delicate sensibilities. Once I reined in Brightness and Color, I was quite pleased with the results. Lucky for me, because the VT2300LED doesn't offer any fine tuning adjustments. I first tested the VT2300LED as a regular HDTV and its picture performance playing back Blu-ray DVDs like Avatar and Watchmen was quite acceptable. The LED edge-lit technology does produce a better picture than traditional CCFL back-lit LCDs like ViewSonic's earlier models. Though once again, I see deeper blacks with the LED direct-lit displays with local dimming and of course with plasmas. But when watching Blu-rays on a 23" screen, the lack of that rich black base will not be that noticeable for most viewers. Now, when I plugged the VT2300LED into my computer using an HDMI cable, I was satisfied in the color rendition of still images but disappointed in the readability of text. Letters were just too edgy. I noticed a halo around them. I did try to make the usual adjustments, but with no luck. I finally decided to connect with a VGA cable and most of the edginess disappeared. Though a minor halo around letters did glow. Even with the VGA hook-up, I think that the VT2300LED is a better HDTV than it is a computer monitor. 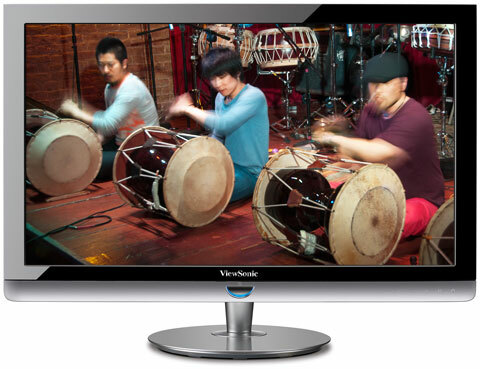 In my earlier review of the ViewSonic VT2342, I wrote, "At the end of 2009, you need to be realistic in your expectations of a 23" LCD. All of the TVs that I have reviewed in this size range simply do not compare to the larger, more technologically advanced and consequently more expensive TVs. As you would expect, the picture quality difference is still noticeable...Maybe by the end of 2010, the differences will be inconsequential." Well we aren't even half way through 2010 but even though the VT2300LED is not a 120Hz display, its LED edge-lit screen is bridging the technological and qualitative gap with its bigger brethren. As for audio, that gap still exists. When I listen to stirring soundtracks, I can just imagine those tiny 5W speakers inside this TV just straining to cut the mustard. But they simply aren't brawny enough to output the needed depth and breadth. The Audio menu provides five Equalizer presets, Music, Movie, Sports, Standard and Personal. Also you can experiment with the SRS TruSurround HD feature, which I found more effective for movies. For concert Blu-rays, Surround Sound seems to spread out the vocals too much and lessens their impact. The VT2300LED supplies a digital audio out. I recommend that you recruit it to bypass the TV's speakers and send the audio directly to a soundbar or even an inexpensive pair of computer speakers. 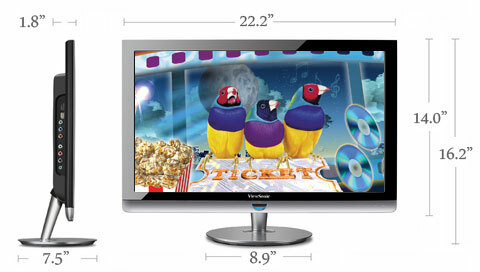 The LED edge-lit VT2300LED ratchets up the picture quality of ViewSonic's line of LCD TVs. The 23" 1080p HDTV is a great size for a dorm room or bedroom. And to wring even more value out of it, you can use it in your home office as a computer monitor/HDTV. I purchased the Viewsonic VT2300 LED FHDTV about 2 months ago, I bought it online, I only paid $229 for it brand new, it has exceded all my exspectations, the picture quality on over air HDTV is amazing, the only downside of this HDTV is the built in speakers, but with the digital audio out , I have connected the Viewsonic to my Home theater system, and audio is then great, I would have bought the 32' model but it's only 720p, the 23' is 1080p even at 60hz refreash rate there is no blur or ghosting, picture quality on Blu-Rays are as good as an exspensive model costing $500 more, As a PC monitor is acceptable but reading type can be dificult if your not sitting close to the screen, but as a HDTV it can't be beat for the price, this is my first purchase of a Viewsonic product and hope to be a loyal customer in the future. Anyone looking for a small to mid sized LED-HDTV for under $300 this is the one to buy.